The new rocket that Colorado-based United Launch Alliance (ULA) is planning on launching as soon as 2019 has completed its Preliminary Design Review (PDR). The version of the booster that underwent the PDR includes two Blue Origin BE-4 rocket engines in its first stage. Representatives with ULA consider the completion of the PDR an important milestone in the booster’s development. The PDR is held to validate that the design meets the stringent requirements that Vulcan will have to adhere to, in order to fly payloads for NASA, NOAA, the Department of Defense, National Reconnaissance Office, and commercial satellite customers. “Vulcan Centaur will revolutionize spaceflight and provide affordable, reliable access to space with an American main engine,” said Mark Peller, ULA’s program manager for major development via a release issued by the company. ULA has a full schedule slated for this year, with 14 missions set to be launched by the end of 2016. As for Vulcan, ULA is basing the rocket on the two boosters that the company currently fields, the Atlas V and Delta IV, that lineage was made clear during a recent conversation with ULA. “The name Vulcan refers to the newly-designed booster of the rocket, but the Centaur (which currently serves as the second stage for Atlas) that will sit on top of that new booster – is essentially unchanged,” ULA’s Jessica Rye told SpaceFlight Insider. ULA is currently working with two U.S. based rocket engine manufacturers to provide engines for Vulcan. The BE-4 engine, produced by Kent, Washington-based Blue Origin, and the AR-1, produced by Aerojet Rocketdyne. 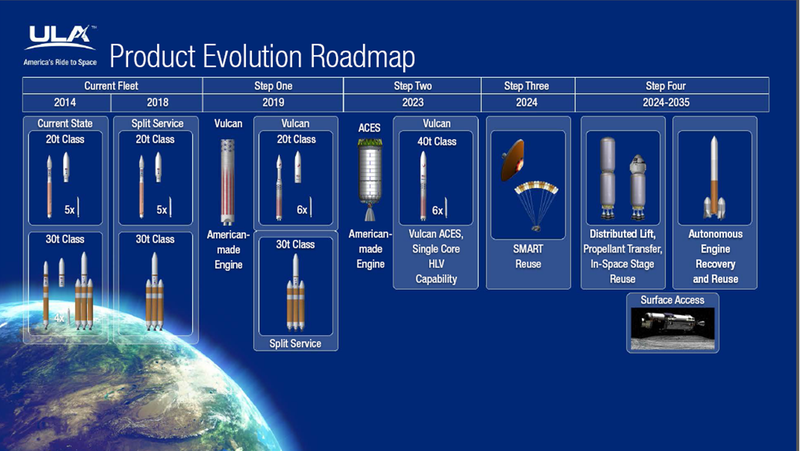 Similar to the Delta IV and Atlas V, Vulcan will be configurable to include differing numbers of Orbital ATK GEM 63XL solid rocket motors (dependent on the size of the payload that Vulcan will be required to send to orbit). While reliability is paramount for delivery of $2 Billion spy satellites to orbit, it is cost that will determine if there will ever be an economically viable space infrastructure, one that will allow humans to expand our presence and telepresence across the solar system. BTW, what LH2/LOX engine is envisioned for the ACES? Will it be a Rocketdyne creation? It’s our understanding ULA is leaning toward Blue Origin’s BE-3 rocket engine for ACES (which burns LOX/Liquid Hydrogen).